Our 6 days wildlife tour takes you on one of Uganda’s best safari experiences to Murchison Falls National Park and Queen Elizabeth National Park famous for their biodiversity. Queen Elizabeth National Park for instance, hosts a bird population of about 600 species. On this wildlife safari, you get to Visit the amazing top of Murchison Falls,enjoy game drives and boat cruises along the famous River Nile and the Kazinga Channel! The wildlife to lookout for include:lions, elephants, buffaloes, giraffes, topi, oribi, water and bush bucks, plus Uganda Kobs, and more. Along the way to Murchison Falls National Park visit Ziwa Rhino Sanctuary to track the rhinos accompanied by a ranger. Ziwa Rhino Sanctuary is run by Rhino Fund an organization that is working to restore Rhinos into Uganda’s wild. After breakfast our guide/driver picks you from your overnight accommodation to transfer to Murchison Falls National Park a must-see for a variety of wildlife. Visit Ziwa Rhino Sanctuary a private ranch that protects the re-introduced Rhinos into Uganda’s wilderness for tracking. Have lunch at the sanctuary and thereafter continue to the park to visit the top of the falls and take some great photographs. Start the day at dawn with a game drive to spot a variety of early riser nocturnal animals and other wildlife including some of the big five like lions,elephants and leopards. The others are warthogs, water and bush bucks, buffaloes, giraffes, topi, and oribi among others. Return for breakfast and relax till lunch and after go for a boat cruise along River Nile that finishes at the bottom of the falls. This boat cruise gives you the opportunity to see hippopotamus at close range and other wildlife species like birds plus the day’s highlight,the huge Nile crocodiles on the river banks. Bring a well charged camera for stunning photograph opportunities for great memories of your holiday to Uganda. At the bottom of the falls hike to the top of the Falls (approx. 1 hour) to see where the world’s longest river explodes violently through a narrow cleft in the Rift Valley escarpment to drop into a foaming pool 44m below. After breakfast exit the park via the southern side with fantastic views of the escarpments in the rift valleys on the way to Fort portal with lunch en-route in Hoima town. Wake up for an early breakfast before heading to the park headquarters for briefing about the park and the rules that guide chimpanzee trekking. 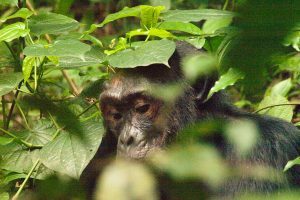 After the brief head into the tropical rain forest accompanied by a ranger guide to search for the chimpanzees and other primates like the black and white Colobus, vervet monkeys, and mangabey among others. Return from the trek to have lunch and thereafter set off to Queen Elizabeth National Park. On arrival head straight for a short game drive to Kasenyi mating ground to spot some wildlife species like elephants, lions, buffaloes, water and bush buck, warthogs and Uganda Kobs, before checking in for the night. An early morning game drive along Kasenyi and Queens Mile provides visitors opportunities to encounter elephants, buffalo, water bucks, warthogs, lions, Uganda Kobs and to see some peculiar water bodies plus a variety of birds. 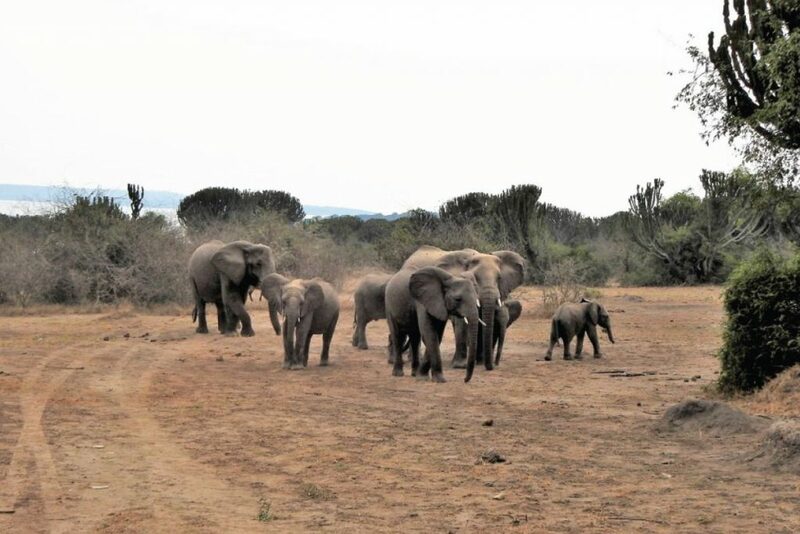 Your game drive will last up to 4 hours; thereafter return to the lodge for refreshments and breakfast. After lunch we go on a boat ride along the famous Kazinga channel for great opportunities to encounter hippopotamus, buffalo and elephants along the channel’s banks among other wildlife. The boat trip takes visitors to see a variety of bird species among which are migratory birds depending on the season of the year. After breakfast head to Kyambura gorge for a primate walk and the species here include: black-and-white colobus, red tailed monkeys, baboons, vervet monkeys, and chimpanzees. Bird species to see here include: blue-headed bee-eater and African fintoot among others. A walk in the gorge is unpredictable but is definitely rewarding because of its diverse fauna and flora. Return from Kyambura gorge to proceed to Kampala with Lunch along the way and a stop at the equator to have a look at curios for possible souvenirs to take home.